On that day during October 2016 where the world first got a look at the Nintendo Switch, Image & Form revealed a new game was in the works. Just over a year later, SteamWorld Dig 2 debuted first on Nintendo Switch before coming to other platforms and going on to be a huge success. Within a few months of the initial release of Dig 2, Image & Form proceeded to release SteamWorld Heist: Ultimate Edition on Switch and then they re-released the first Dig game in February 2018. It’s almost a year later and once again Image & Form have revealed even more SteamWorld is on the way and this time, it is an entirely new game for the SteamWorld series. 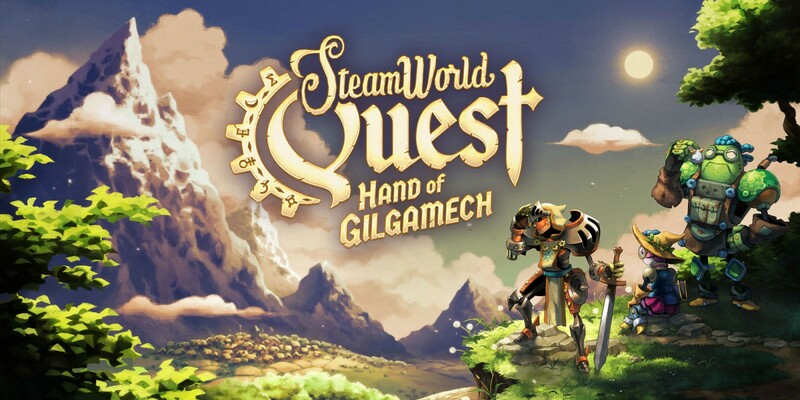 Miketendo64: How long have you been sitting on the announcement for SteamWorld Quest? Brjánn Sigurgeirsson: Oooh, we’ve been sitting on that for what feels like a really long time! At some point, you think it’s inevitable that information will leak. For example, I myself sometimes forget that no one outside the office knows, as all day long we’re looking at all the aspects of an upcoming game. The game is all we talk about in the office, but outside we have to keep quiet. It’s quite the juggling act! Miketendo64: At which point did development begin on Quest? Brjánn Sigurgeirsson: We started pretty much right after SteamWorld Dig 2 was concluded. We had a pitch round where everyone was allowed to present their ideas in front of everyone else. It wasn’t a perfect setup, but it brought forth a lot of ideas. Miketendo64: Did the RPG tweet and the results factor in the decision process for SteamWorld Quest? Brjánn Sigurgeirsson: Yes and no. We had heard before from fans and followers that they’d like to see us try our hands at an RPG, so we strongly believed many would want exactly that. We had already started developing Quest and were making good progress when we sent out the RPG tweet. It’s kind of funny to look at that now. Sometimes we can’t help ourselves, it’s like we NEED to gossip about our coming games! Miketendo64: How does it feel to finally put the SteamWorld Quest name to good use? Miketendo64: Given the success of Dig 2 and the physical release, will you be aiming for a day 1 physical release for Quest? Brjánn Sigurgeirsson: Probably not, we never do. That’s for practical reasons – we typically have to work on a game right up to the very last minutes before it HAS to be approved by Nintendo, and the lead times for physical production is always way, way longer than that. But we love physical editions just as much as the next guy. We’re likely to publish that at some point. Miketendo64: Aside from having a fantasy setting and RPG mechanics, in what other ways, including visually, does Quest differ to your previous SteamWorld works? Brjánn Sigurgeirsson: Oh wow! SteamWorld Quest is as different from any of the other games as they are different from each other. But one thing sets Quest apart: the fantasy setting itself is really absurd. The other games follow the “plausible” [sic] SteamWorld timeline: humanity blows itself to bits around the year 1900 after having created fairly simple computers and automatons some 100 years earlier than in real life, and the simple machines continue to go about their business. From there on its SW Tower Defense, SW Dig, SW Dig 2 and SW Heist. Someday we may even make a game or two that fit somewhere in between those games. But a medieval setting? How is that possible? Even the robots know there were no robots in those times. But we’ve got it worked out. Miketendo64: It’s probably too early to say, but can we expect to see gameplay during PAX? Brjánn Sigurgeirsson: I’m actually not sure. We’re swamped and probably won’t make it. We’ll bring Quest on two separate press tours, one at GDC and one at PAX, but we decided against a booth at PAX this year. We’ve done that many years in a row now, and it entails so much work. We’re hoping that we can do something together with someone, but we’ll see. Miketendo64: We’re half expecting a no on this, but since SW is coming to other platforms after the Switch release, are there plans to do a 3DS release like you did with Dig 2 last year, or has that boat now passed? Brjánn Sigurgeirsson: It’s a very good question, and the very good answer is that Quest won’t come to 3DS, unfortunately. We brought SW Dig 2 – and all the others before that, of course – to Nintendo 3DS. We were taken aback by how “well” the Switch had replaced the 3DS in terms of digital sales. It’s safe to say that although there are many 3DS owners, the ones that were tech-savvy enough to buy games from the eShop were also tech-savvy enough to switch to, well, Nintendo Switch. I track our sales meticulously, and you wouldn’t believe me if I told you by how many times the Switch versions of our games outsell the 3DS versions. Miketendo64: Will the Switch version take advantage of any Switch specific features? Brjánn Sigurgeirsson: That’s an interesting question. It’s almost philosophical: I’d say that what makes the Switch unique is that it’s completely unique. It’s just different from everything else out there, and it’s perfect. That’s all the specificity a platform needs, I think. I’m sure we’re using HD rumble, for example, but I haven’t thought very much about it. When I play SteamWorld Quest on one of our Switches, it feels exactly the way it’s supposed to feel. As always, thanks for being such a great sport Brjánn. For those of you who wish to know more about the upcoming title, we insist you consider following @ImageForm on Twitter or ourselves as we will be sharing SteamWorld Quest news at every turn!